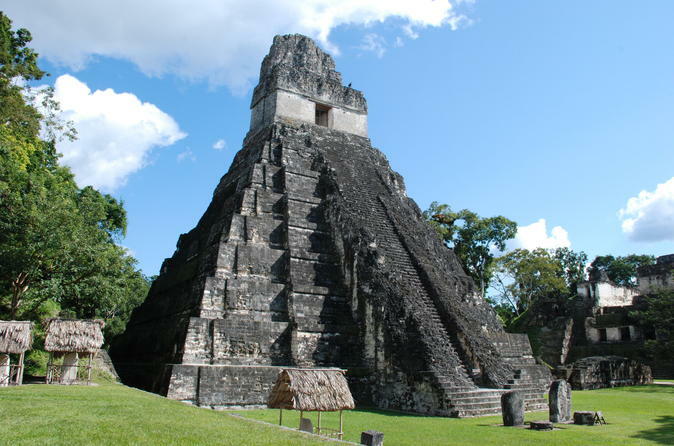 Today you will go back more than 2,000 years in time when you visit the Tikal National Park. Today you will go back more than 2,000 years in time when you visit the Tikal National Park. At 04:15 a.m., you will be picked up at your hotel for transfer to the airport to board the flight to Flores, Petén . On arrival, our representative will take you to the Mayan City of Tikal which is located in the center of the National Park that bears its name, and has an extension of 222 square miles. Tikal was inhabited from 600 BC., till 869 AD. Its highlight was between 690 till 850 AD., a time period known by archaeologists as the Late Classic. Visit the Twin-Pyramid Complexes “Q” and “R”, Lost World Complex where the Great Pyramid and Temple 5C-49 are the most important. Also, visit Temple III and the Palace of the Windows, the Great Plaza, squared off with the pyramids of the Grand Jaguar and the Masks, the Palace of the Nobles, and Pyramid IV. This one is the highest of the Mayan pyramids, from its top a complete view of Tikal and its surrounding jungle can be enjoyed. In the afternoon transfer to Santa Elena’s Airport, in Flores, Petén, to board the flight to Guatemala City. On arrival, our representative will transfer you to (Hotel) for overnight accommodations.